Little has changed in the condo/townhouse markets over the last few months. The market continues to slow heading into the slow winter months. Despite a substantial drop in sales, inventory remains scarce keeping prices relatively stable. There are a lot of moving pieces right now and the condo/townhouse gets quite complicated compared to the detached market which clearly favours the buyer as inventory hits normal levels while sales plummet 52%. REBGV condo sales fell 22% year over year, however sales were still 13% above the 10 year average. New listings remain scarce. Sellers simply aren’t selling right now, it appears most are waiting for the New Year. 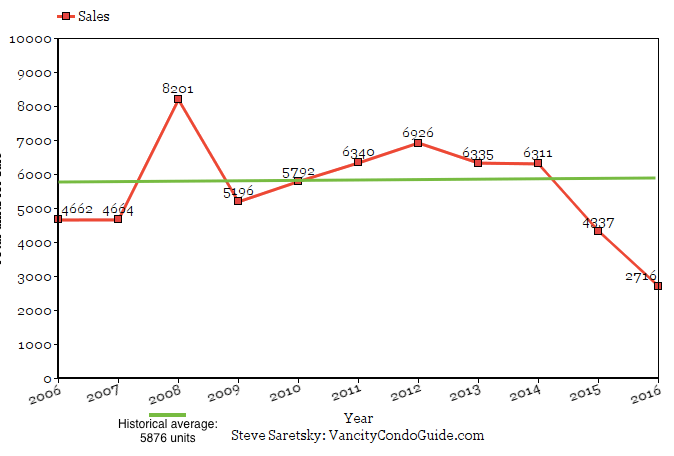 REBGV condo new listings were down 7% year over year. 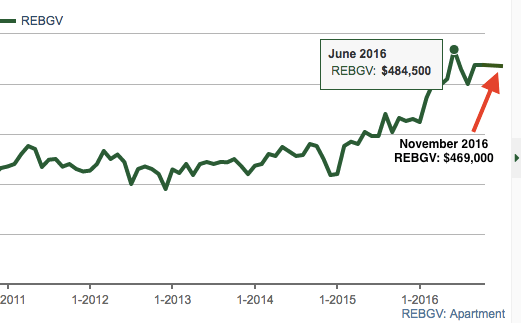 Total condo inventory for REBGV was down 37% compared to November 2015. Sales/actives ratios are up from October. However, this is not due to an increase in sales but rather a significant decrease in inventory. Anything above 20% is considered a sellers market. Months of inventory also suggest it is a sellers market. Anything below 4 months is considered a sellers market. Prices appear to have tapered off and in most areas are down by roughly 5%. REBGV condos show a 3% correction from the peak. The condo market has definitely cooled off but still remains a sellers market. Most condos sell quite easily, but the days of bidding wars are well behind us. Multiple offers are much more rare and most deals have subjects on them. Demand has definitely tapered off with sales falling 22% year over year. However, inventory remains scarce with record low inventory levels. Despite low inventory we are not seeing any increase in prices, in fact there seems to be a roughly 5% drop in prices across the board. 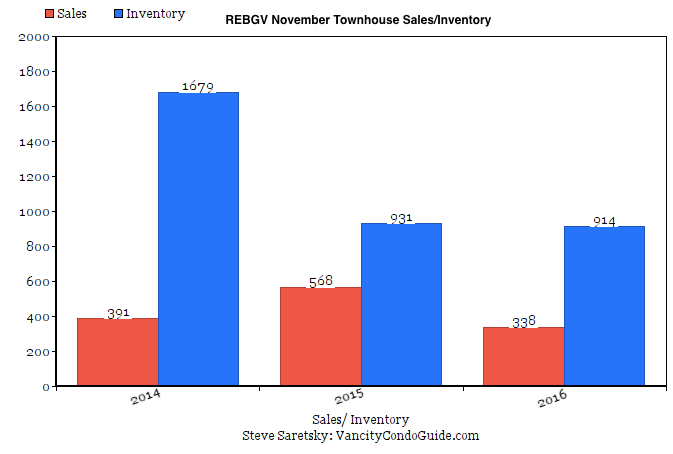 REBGV townhouse sales were down 40% year over year and 10% below the 10 year average. This is a significant change from the record number of sales we hit last year. New townhouse listings in REBGV fell 9% year over year. Total inventory fell 2%. Despite inventory falling 2%, sales fell 40%. Inventory hit record lows this year but despite that sales still plummeted and prices flat lined. For comparison, in November 2015 inventory fell 45% year over year and sales jumped 31%. We have a complete reversal this year. Sales/actives ratio climbed 4% for REBGV townhouses. Again, this is not from an increase in sales but a decline in inventory. Anything above 20% is indicative of a sellers market. Anything below 4 months is considered a sellers market. Richmond has entered a balanced market according to months of inventory. Median sales price for REBGV townhouses is down 4% from it’s peak in June. This is roughly in line with what I am seeing on the ground. You have a roughly 5% correction on most townhouses. What’s important to note here is that sales have dropped 40% year over year. That is much more than a simple cool down. However, inventory has also dropped which is keeping prices from declining further. With lending policies tightening and further new construction on the way expect to see few sales combined with more inventory coming onto the market.